This year for ANZAC day we assisted Yarra Trams with two productions: a series of posters for the Melbourne Tram Museum in Hawthorn and large format signs in the form of banners for the Anzac Centenary at tram stops close to the Shrine Of Remembrance. The Tram Museum posters were part of the Tramway Anzacs and honoured 538 of the Melbourne tramway employees who volunteered for military service in World War I; and remembrance of the 86 who died in the conflict. 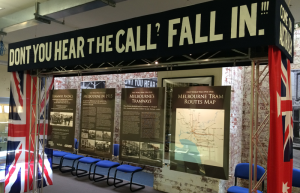 From the unique perspective of the tramways the exhibition looks at how the war affected Melbourne, the employees who served and the importance of the tramway system during the war. It’s also interesting to note that Melbourne was the capital of Australia during wartime. We produced eight A1 posters within a very short time frame to make sure they were delivered on time for this important display. They were printed CYMK with UV cured inks on a matte 250gsm paper. The tram museum is a great place to visit with the family as you can wander through the various trams from the past 150 years and experience a piece of Melbourne history guided by well informed staff who can give you insights into the tramway’s past. The second project was a series of PVC banners that decorated the Domain Interchange and Arts Precinct tram stops near the war memorial along St Kilda Road. These were printed and then installed late at night ready for the launch the following day. These vinyl banners were extremely effective and stood out amazingly well down such as busy thoroughfare. At Barneys we are proud to be a part of these Yarra Trams initiatives and commemorate our fallen ANZAC heroes.